Mark, my partner of nearly twenty years, my best friend and the better half of Chamfron Stud passed away in January after a short illness. Marks funeral will be at 1pm on the 10th of February at Mortonhall (Edinburgh). All friends and family are welcome, no flowers, thank you. Inca has also gone to Joshua Morris Lowe to play polo. Lovely to get the last two foals away together as they were good friends and it means all the 2016 foal crop are now sold. Colibri has gone to Joshua Morris Lowe to be a polo pony. Ella has also headed off to Essex, she goes to Shaun Molyneux and the plan for the future is long rides (ambition to join the Long Riders Guild). Absolute sweetheart of a foal, I shall miss her! Ethel has be sold to endurance rider Clare Wilde in Essex where she will join the five year old Arrayan Numa youngster Brujo Numa (bred by Janey Martin). Our lovely high goal polo mare, Morena, is off to Wiltshire to join Ally. She is booked in to visit Arrayan Numa in 2017. Yearling Aggie has gone to her new home with vet Kirstin Miller, the plan is for her to be an endurance pony, a job I think she will adore. Callie is the first of the 2016 weaned foals to go. She has gone to Caroline Clarry and joins her Chamfron clan of Bombero, Nicobar, Almendra and full brother Milano as a future polo pony. Harmony has gone off to her new home with Julie Wilkie. A nice mare, tough as old boots, she has bred us three great foals, Paloma, Milano and Calandria and never been a moments bother. Yearling Chamfron Zamba won all her classes and was Reserve Champion in hand on her first showing outing. I had a super drive up to the Scottish Appaloosa show with the mist rolling down the hills and in to the valleys as the sun broke through. Anne unfortunately missed a couple of her classes with Chamfron Chaco falling foul to the constant problem with this show venue, it appears to be in the land that sat nav forgot. Still he was a very good boy getting second in the yearling class. He then stayed on to offer his support as cheerleader to the polo ponies in the games. He was probably shaking his head at my very weak effort barrel racing when Anne kindly leant me Bayo. It was lovely to see the ex Chamfron broodmare Oor Eagle Eye Cherry at the show, looking fantastic and winning the broodmare class followed by taking reserve champion female. However it was her Arrayan Numa foal, WD Where Eagles Dare, that stole the show. She won her foal class, took the female championship then stood SUPREME CHAMPION of the show. She is everything an Arrayan Numa filly should be, bold brave and beautiful and she made me smile all day with her super cheery attitude to life. What a star! Malambo has gone on loan to Denise Playfair in the Scottish Borders. ​I am looking forward to seeing him back under saddle! ​Chamfron Olegario has arrived safely in his new home - he has gone to join his half brother Chamfron Kukri and his full sister Chamfron Colada with Gemma Hope. Olly and his dam Sue Ellen were bought for Gemma as a wedding present by Stuart her fiancé and I think we all managed to keep the secret! Sue Ellen who has been the most superb broodmare for us has landed on her feet for sure, living with three of her children in a fantastic home. Chamfron Bellini had a successful day out at the Isle of Wight County show, winning the youngstock class and second in the world breeds (a big class with ridden horses included). As always beautifully turned out by Natalie. Tammy is the last of the sold mares to foal, down in Wiltshire with Ally. Breaking the run of gingers by producing a lovely bay roan filly. I am so pleased that everyone that took the gamble and bought an in foal mare got a healthy foal and is happy with them. Chamfron Compostela foals a chestnut roan filly by Arrayan Numa in her new home with Suzanne Willis. 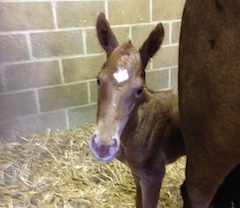 Lady Erica foals in her new home - a very bold chestnut roan colt has arrived for Lauren at Sannabay Sports Horses. Our stunning two year old Rosa has gone to join Leigh Nixon in Northamptonshire. She will mostly be aimed at a TREC. Her new experiences start tomorrow - meeting the Alpacas! Oor Eagle Eye Cherry foals in her new home. A lovely chestnut roan filly by Arrayan Numa named WD Where Eagles Dare. Shown here at 12 hours old. Our own foals can be seen on the Foals 2016 page - so far we also have chestnut roan fillies! Chamfron Kahlua has also headed to Oxfordshire to be a polo pony with Laura James, Pookie is always happy and cheery and I shall miss her dreadfully but am very much looking forward to seeing her playing. Chamfron Almendra is away to Oxfordshire to join Caroline Clarry's pink polo string and will be living with three other Chamfrons - Milano, Bombero and Nicobar. Lauren admired Ruby when she came to pick up Erica last week and we are pleased she decided to add her to the Sannabay Sports Horse broodmare band. ​Stela has been sold to Suzanne Willis in East Sussex. She is in foal to Arrayan Numa for a May foal then at weaning she will go back under saddle for a life of hacking and hunting. Arrayan headed off to his new home today, he has gone to Susan George and will be working cattle as well as covering mares. A lovely life for him but yes, I've nailed my colours to the mast, Chamfron Stud is taking a hiatus. The lovely kind thoroughbred polo mare, Lady Erica, has been sold to Lauren Piercy at Sannabay Sports Horses and we eagerly await her Arrayan Numa foal in May. Chaco has been sold to Anne Smith in Ayrshire and will have a wonderful busy life of hunting and polo. Tammy was purchased with Bridget as a weanling at Doncaster sales and they have always been best friends so it absolutely made my day with Ally decided to take her as well. Just the kindest mare you could wish for and all her foals are the same. Ally is so pleased with Zamba she has come back and purchased her dam. Bridget is a wonderful, elegant mare who has produced the most athletic quality foals for us, I am thrilled she has got such a lovely home. Santi, the first of the second generation Chamfrons has headed off to his new home with Emma Lang in East Lothian. He will be aimed at an endurance career. Results from the SERC Tayside Awards 2015 show Chamfron By Dand and Rebecca Crump did rather well in their first (fairly relaxed) season of endurance. Photo with kind permission of Kris Clay. Because one Criollo is never enough Campeador has also gone to Wiltshire with Zamba and he will hunt with Ally's husband. He is going to be a very impressive hunter! Zamba has gone to Wiltshire to event with Ally Weller. I think that Zamba is very classy and I'm excited about her future. Marks favorite polo pony Pitufa and the Uruguayan Criollo mare Yaya Gaitan have gone to join Chamfron Perdita and Chamfron Osito in Cheshire. ​Heartbreaking to sell Pitufa as she was "the other woman" in Mark's life but she is a brilliant pony who deserves to be appreciated. Our yard mascot "Mule of Kintyre" - Treacle has been sold to Jo in Yorkshire, where she will join her other two mules and a donkey. Treacle is the best of mules, utterly infuriating at times but she never fails to rise to an occasion. I hope she will make a come back at Lambshill Show this year and I shall go and be her support crew! Quintana had a short trip down the M6 this morning to her new home in South Cumbria. 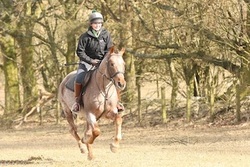 She has been bought by Thomas Smith as a future polo pony.